Comedy clubs are so passé, walls and roofs have been done to death, the future of comedy is on the road. Leading the mobile funny-fest revolution is Bob Slayer, Edinburgh Fringe regular and owner of The BlundaBus, a successfully crowd funded project to convert a double decker bus into a bar & comedy venue. 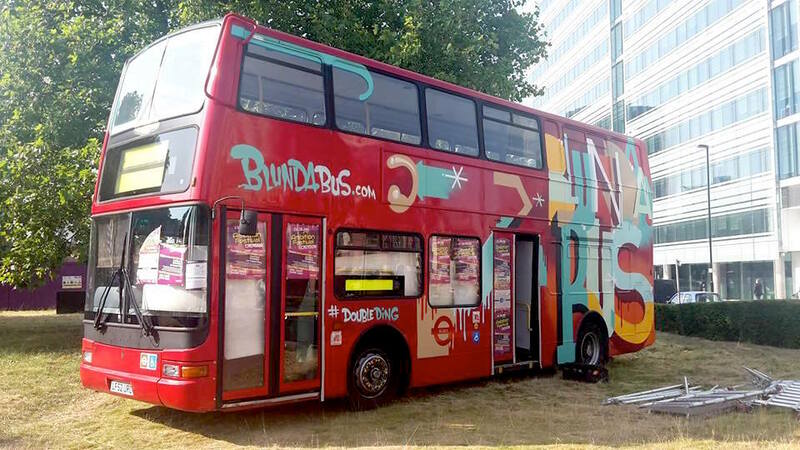 Launched in mid 2015, the bus has made a number of red carpet appearances at the Croydon Comedy Festival, Livestock Festival in Gloucestershire and the Fringe itself as an independent venue, to name but a few. During October you’ll find Bob’s Bus in Hackney East London (except between the 16th-18th as it will be taking a brief musical interlude in Whitby), click HERE to check the event listings. The bus will be back on the Hackney Road in November after it’s stolen the show at the Nottingham Comedy Festival (grab tickets HERE), it’ll be sticking around till Santa kicks it out in mid December, so caught the bus before it drives off without you. Tom and Rich (the owners) were on a road trip across America and they stopped to re-fuel in Portland, Oregon. On the recommendation of a close friend they visited “this amazing local pizza place”, Dove Vivi. It was there they discovered a food sent from the heavens. Cornmeal crust pizza. They found a café close to Notting Hill that needed a bit of a re-paint. They went for some training in Portland. And then they took a punt, got some builders in and opened up, offering cornmeal crust pizza for the first time in the UK. They use a cornmeal and flour mix in our pizza crust to give it a distinctive flavour and texture. The cornmeal makes their crusts stronger and more robust than a normal pizza, which allows us to be more creative (and generous) with their toppings. The cornmeal they use means that their pizza crusts are higher in fibre than normal, which makes them more filling. They also put far more topping on their pizzas, as they believe this gives them a much better flavour. Check out the restaurant or website for further info and current specials. On Sunday 19th June the specials were Brie & Grape and Sausage & Sweetcorn. Located in the heart of Maida Vale in Little Venice, Raoul’s was established in December 1985 through the drive and determination of a self-proclaimed “bored housewife” Geraldine Leventis. Geraldine was used to entertaining large numbers of guests over the years, one of whom was the painter Francis Bacon, and it was he who pressed her into opening her own restaurant. Over the past 20 years Raoul’s Café has successfully combined a trendy and stylish setting with a friendly and relaxed atmosphere. Its popularity and reputation has steadily grown over the years and the Café has seen a regular and interesting mix of clientele of all ages. This is also a good place for celebrity spotting, especially during summer time, seated under the sun enjoying our delicious drinks on the terrace. The Café offers a great Mediterranean menu, starting with Breakfast, Continental & English, followed by a Lunch menu from 11.00 am with the daily specials. You will find such dishes as Full English Breakfast with Cumberland sausages & the golden yellow Italian eggs that are a speciality, slow cooked British lamb shank, Caesar salad & organic salmon burger. The dinner selection is served from 6.00 pm and offers a choice of dishes from around the Mediterranean Sea, such as wild sea bass, grilled halloumi cheese & aubergine salad and Italian hand made pastas. Enjoying a bottle of wine in a Tuscan vineyard in the early 90’s became the inspiration of what is now the premier suppliers of imported Italian food in the UK. No one was importing produce this good in the UK, so we began here in London in 1996. Importing fresh food from Italy to London is our speciality. Machiavelli is a well established, vibrant and innovative company, specialising in importing simply the very best Italian food, direct from Italy. Our dedication lies in quality of the food, the service and our passion in the products themselves. We are proud to distribute Italian Food, produce and ingredients to the top restaurants, delis, stores and hotels in London and nation-wide. 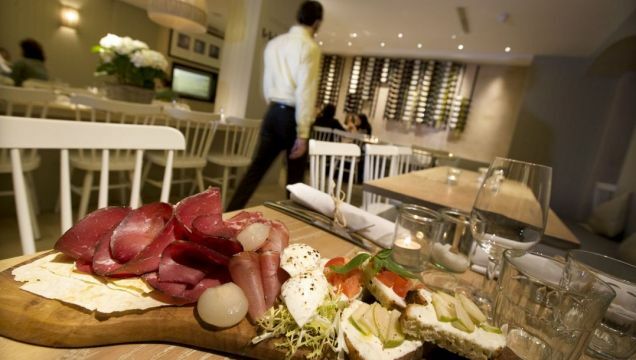 Some very famous restaurants are running on our Italian imported food. We believe the best food is the freshest and it is this philosophy that helps drive our choice of products, arriving twice a week from Italy by refrigerated transport. Specialist artisan foods include fresh handmade pastas from Tuscany, cheeses produced with traditional family recipes from Piedmont, alongside first-pressed olive oils by one of the most prestigious producers in Sicily. The choice of products available is endless – balsamic vinegars, prosciuttos and salamis as well as mouth-watering antipasti and olives grown in the sun drenched groves of the Mediterranean. Italian Food imported and supplied at its very best. Many of our products are sourced from the Slow Food Movement and are D.O.P. / I.G.P. (Protected Denomination of Origin / Protected Geographical Origin). D.O.P. ensures that the raw ingredients are sourced locally as well as indicating place of origin, whereas I.G.P. ensures that all production processes conform to specific local traditions. After years of feeding Shoreditch, Pizza East has opened in west London. Moving into what used to be the Fat Badger pub on the corner of Portobello and Golborne Road, Pizza East Portobello is a restaurant, takeaway and deli spread over two floors. The interior has been stripped back to reveal the building’s original features with vintage furniture, exposed brickwork and distressed paneling throughout. The ground floor is an open kitchen and dining area with full-length windows opening out onto the street. Upstairs is a more relaxed sitting room with a leafy terrace seating up to 20 people. All our pizzas are a 10” base made from the exclusive House recipe, while our fresh tomato sauce is specially prepared by the kitchen. As well as Pizza East’s existing favourites, new toppings will include: Portobello mushroom, tomato shallot and egg; and courgette, tomato, tallegio and majoram. The menu also offers char-grilled monkfish and pancetta, lamb cutlets with endive and caprino fresco, rib-eye steak, garlic potatoes and a full range of desserts. Breakfast is available every day from 8am – in the sitting room and at the deli counter for coffee and pastries, or in the restaurant for something more substantial. The fried egg, pancetta & avocado ciabatta and homemade porridge with banana caramel both update old early morning favourites, while our selection of juices are freshly squeezed that morning. The full a la carte menu is available in the restaurant from 10am. When you don’t have time to eat in, there is a full takeaway and deli counter service. The deli also offers a selection of the restaurant’s ingredients, accompaniments and accessories for purchase. Store cupboard items, including our sauces, oils and salad dressings, are available alongside kitchen basics such as napkins, jute bags and teapots.